Mostly excessive CPU usage caused by the installation and the inclusion of any program that consume the most resources of the system. At 100% load (you can check this by using task Manager) the computer begins to freeze applications – braking and to solve this problem can sometimes only reboot. So, in order to reduce the loading of CPU, you can use the following instruction. 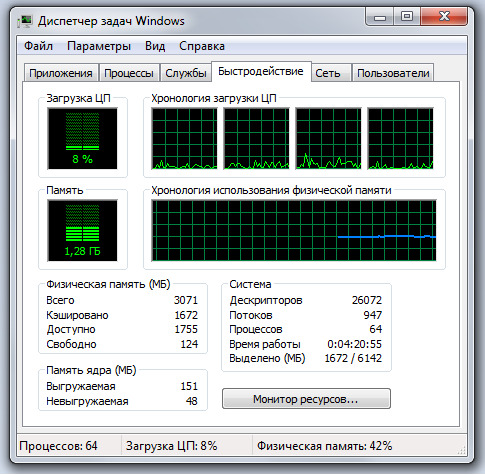 First, open the task Manager in Windows operating system. Then, go to "Processes" view, which programs consume the most CPU. If this is the right program for you, leave it alone. You need to look for only those processes that play no role when working at the computer. But at the same time before disconnecting, check why we need this or that, this way, you protect yourself against unexpected problems. Then, open the Run dialog box, type on the keyboard msconfig. Then go to "startup". This tab lists all programs starting with turning on the system. Remove all unnecessary programs (except antivirus, it is extremely necessary for the correct operation of the computer), it will not damage the operating system. Once you have completed these steps, again go to task Manager and go to the Performance tab. If the CPU load is still large, then you need to defragment disks. Too much fragmented files not only slow down the necessary programs, but also occupy most of the CPU. If you have no time to do a complete Defrag, then spend it only on the system drive (where the operating system is installed). Perhaps it will remove some of the load from the CPU. Clean your PC from temporary files. You can do this using the free program CCleaner. In the most advanced computers, this utility can free up several gigabytes of space. You can also use a special registry cleaner feature. After this operation, you will not only clear space on the hard disk, but also reduce the load of the CPU. Possible, but radical way to reduce the CPU load, complete reinstallation of the system. At the same time you can disassemble the system unit and clean it from dust. Sometimes, excessive load on the CPU caused by poor heat transfer caused by fouling of the cooler and the radiator.